Soft1 Cloud CRM Series 5 is an all-in-one, software as a service solution that assists your business people establish closer connections with your customers, provide professional customer service, sell more and grow your business further. 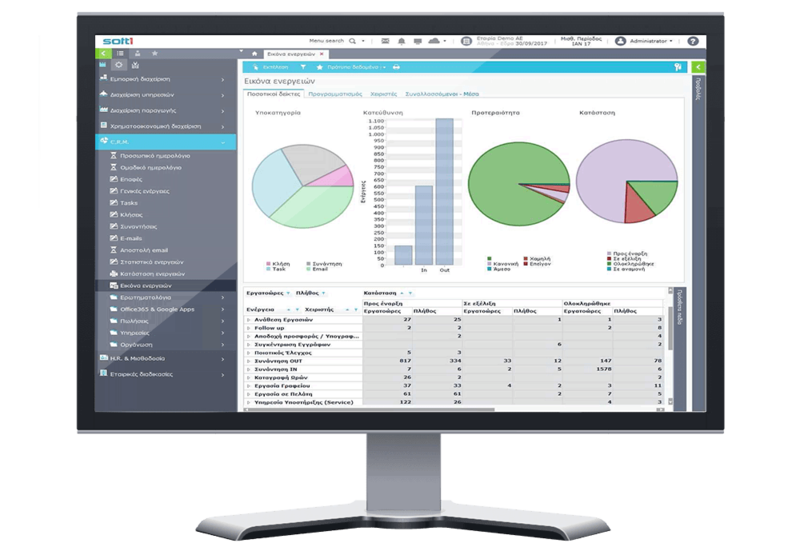 Soft1 CRM Series 5 provides your business with the edge to gain visibility into the most accurate customer information and better understand your client’s behavior. Featuring real-time functionality, Soft1 CRM Series 5 enables your people to connect and strengthen existing relationships as well as create new sales opportunities from anywhere, using any mobile device. Operating on the Microsoft Windows Azure platform, Soft1 CRM Series 5 helps your business reduce its operational costs while your sales people sell more, your managers know more and your customers enjoy amazing services. Bring your customers' information in one place and execute every part of the customer experience, from marketing, sales, support and service. Enable your executives to easily leverage data for resolving support issues and efficiently manage orders, payments, leads and sales opportunities. Stay always ahead of your competition and offer an even greater customer experience through your mobile workforce. Soft1 Cloud CRM Series 5 offers everything your sales people need to effectively manage sales opportunities, track customer information on real-time and execute cost-effective campaigns to turn more leads into customers, faster. Improve your customer relationships and help your people deliver outstanding customer service and support, every time. With Soft1 Cloud CRM Series 5, you can easily automate communications, focus on personalized service and resolve customer issues, better than ever. Easily consolidate customer information with your sales analytics and build comprehensive reports to efficiently identify trends and draw insights. Drive your sales and build loyal customer relationships through insightful customer support. Enable your workforce to manage customer relationships and maximize the value of every sales opportunity. Soft1 Cloud CRM Series 5 offers your sales team all they need to efficiently manage existing and prospective clients at all times, from anywhere, using any mobile device. Forget all the large upfront and ongoing investments to purchase and manage your software and hardware. Simply implement Soft1 Cloud CRM Series 5 to your requirements and run it with a pay-as-you-go, subscription model with no tradeoffs on performance or functionality. Operating on the Microsoft Windows Azure data centers, Soft1 Cloud CRM Series 5 offers you peace of mind with its unparalleled level of security, network monitoring, backup and disaster recovery solutions.